Interlocking towers serving old school rapid transit systems have surprising staying power. In most cases they are often in underground spaces where any sort of demolition would literally bring down the roof. Moreover, transit systems are often sealed, reducing the risk of vandalism, have limited windows for work to be done, making the cost higher and operated in a budget poor environment. However, nothing is absolute and I just learned that a 100 year old IRT interlocking tower on the New York City Subway was demolished this past weekend. DITMARS tower was located at the Ditmars Blvd terminal of the Astoria El in Queens, right in the shadow of the Hellgate Bridge. It was originally built as an IRT tower, before eventually being transferred to the BMT division of the TA in 1948. Although the tower appears to be the victim of fire damage, it is actually being removed for a switch replacement project that requires the use of an on-site crane. 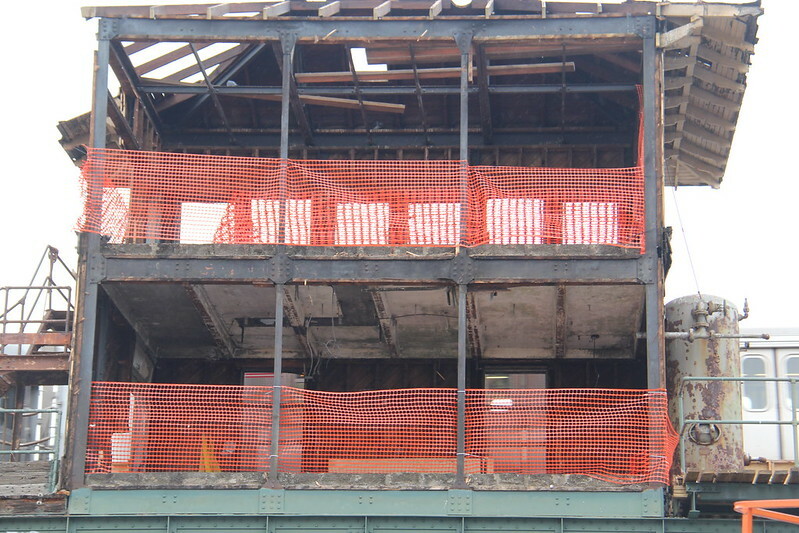 The demolition process actually provided a bit of an interior view showing that wooden appearance of the tower was a facade that surrounded a very robust steel and concrete frame. The upper floor would have housed a US&S EP machine, the IRT being a strictly US&S operation. The lower level would have housed relays wired to the machine above and the appliances out in the field. Note the good condition of the roof structure, which is all the more remarkable given both its age and the amount of neglect the tower must have seen through NYC's lean years. 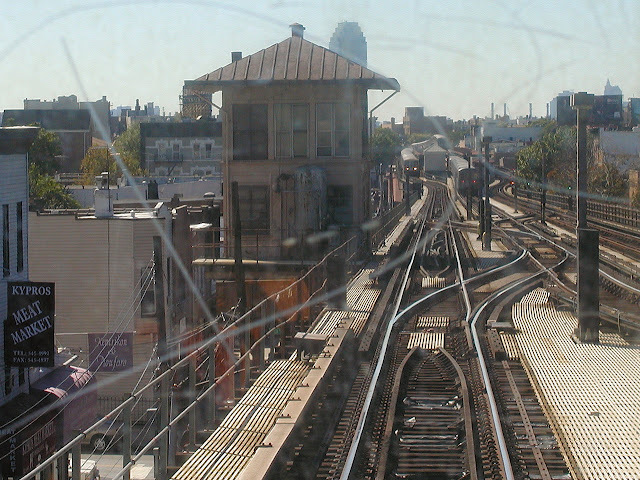 DITMARS tower controlled a 3-track full crossover leading into a 2-track terminal station. Note the large air reservoir to power both the local point machines and the pneumatic trip stops all up and down the line. The tower was closed in 1989 as part of a full line re-signaling project, although the line was equipped with new US&S hardware, if that is any consolation. Fortunately, DITMARS has many siblings up and down the former IRT elevated lines in the Bronx and Queens. Almost all of them are out of service, but still hang on as relay rooms or CnS hangouts. 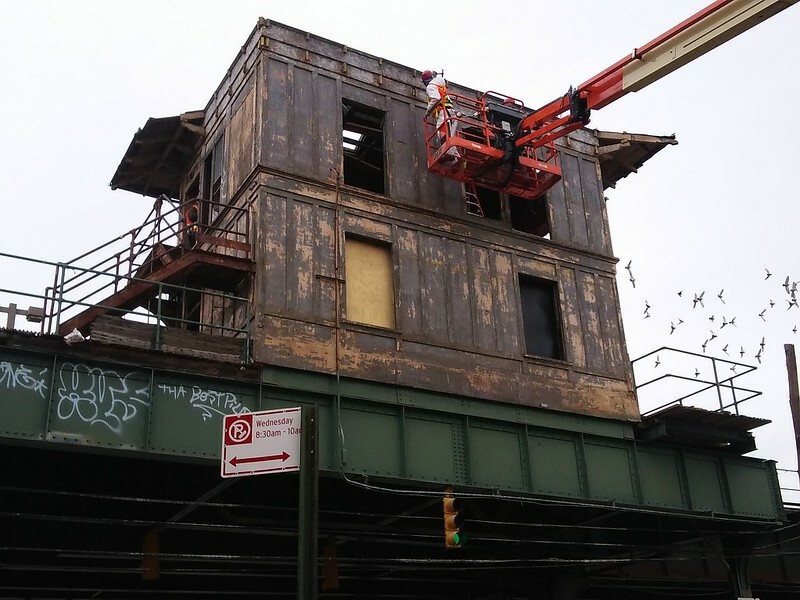 One old IRT elevated tower, 111th St, on the IRT Flushing, is still active, albeit with a fairly new master control NX panel installed.